Dinner just got interesting! 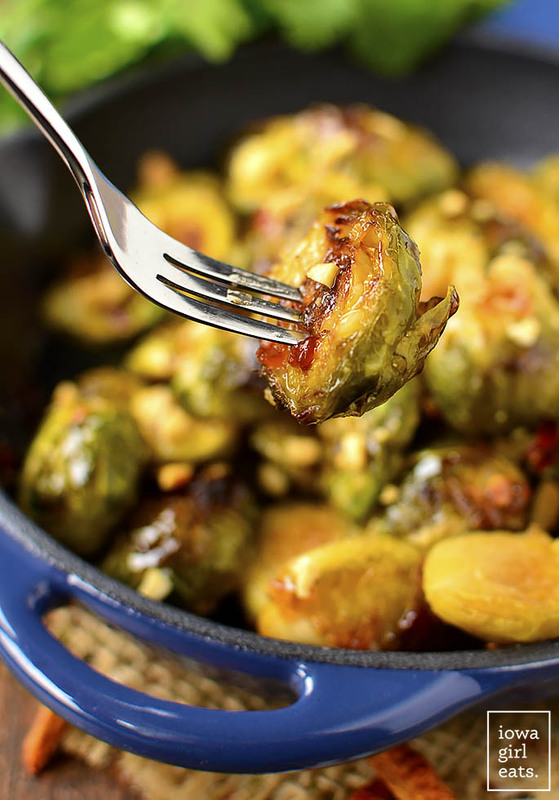 Sweet Chili Roasted Brussels Sprouts are simple yet scrumptious. 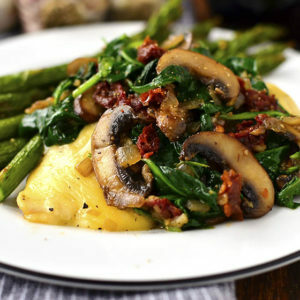 The perfect gluten-free side dish to liven up any ho hum meal. Raise your hand if you’re in a side dish rut! Unlike my current hair rut (another day another ponytail,) wardrobe rut (all gray every day) and music rut (one word: MOANA,) a side dish rut is a simple one to get out of. 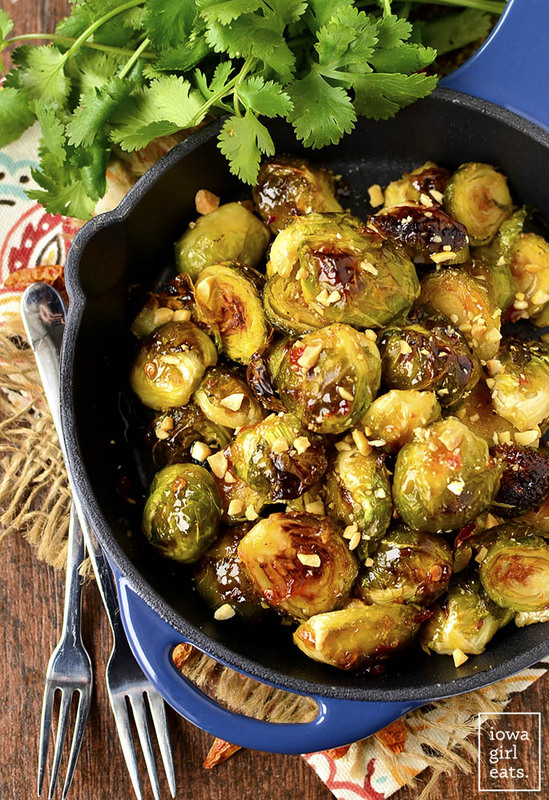 If you’re like me and have entrees planned out for the week but find yourself toe tapping in front of the refrigerator every night trying to decide what to serve with them, try THESE >> Sweet Chili Roasted Brussels Sprouts! I’m just going to go ahead say that roasted brussels sprouts are even harder to photograph than orange food which is really saying something, but I promise these sweet chili glazed brussels sprouts taste way better than they look. 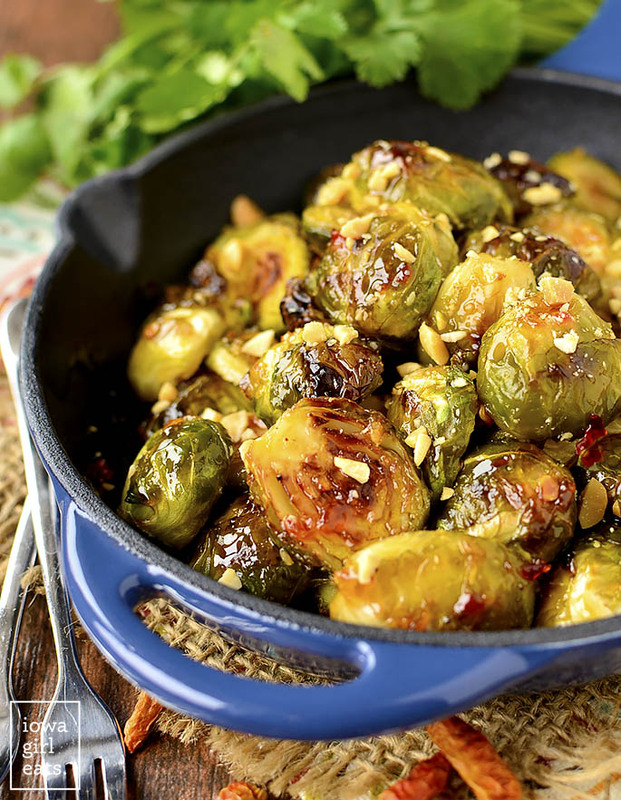 Simply seasoned roasted brussels sprouts halves are brushed with sweet chili sauce then popped back into the oven until they’re sticky, glazed, and sizzling. RIGHT? A sprinkling of chopped peanuts on top is the icing on the cake. Proverbial of course, because, gross. I mean, the combination of salty, savory, sweet, and a touch spicy sounded yummy in my head, but it turned out even more delicious than I imagined. LOVE when that happens! We never ate brussels sprouts growing up so I only know of them in their Heavenly-tasting roasted or shredded form, aka my favorite ways to cook them. But if you were the victim of a boiled brussels sprouts upbringing, try this recipe before writing them off forever. 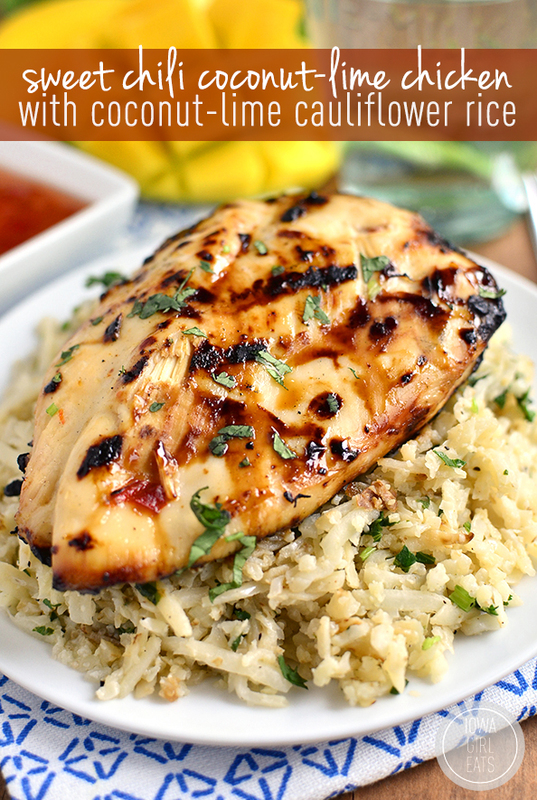 The sweet/savory combination is a can’t miss, plus I promise they’ll liven up any dinner you pair them with! So there’s only 2 steps to this recipe. First, trim then halve 1-3/4lb brussels sprouts and add them to the center of a foil-lined, nonstick-sprayed baking sheet. 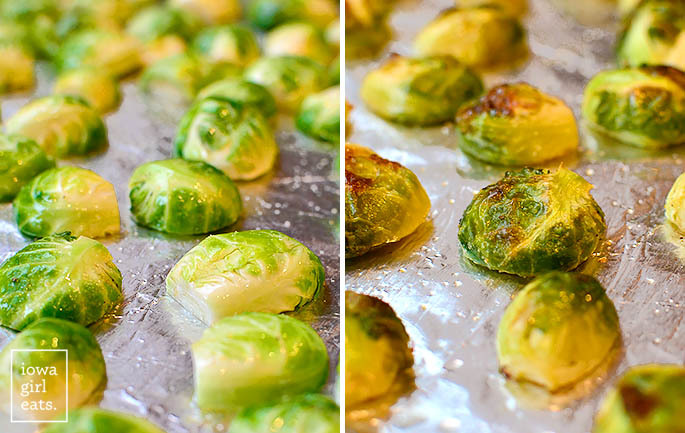 Drizzle on 1 Tablespoon extra virgin olive oil and garlic powder, salt, and pepper to taste then toss with your fingers to coat and arrange the sprouts in a single layer cut side down. Roast at 425 degrees until golden brown, 15-17 minutes. Next, stir together 1/4 cup sweet chili sauce (I LOVE Grama’s Sweet Chili Sauce!) and 2 teaspoons gluten-free Tamari or soy sauce (dish will not be GF if using traditional soy sauce,) then use a pastry brush to gently dab the mixture on top of the roasted sprouts. Pop them back into the oven for 5-7 minutes or until the glaze is hot and bubbly. Serve the sprouts with extra sweet chili sauce for dipping, if you please, and a sprinkling of chopped peanuts for a little crunch and pop of saltiness to contrast the sweet sauce. 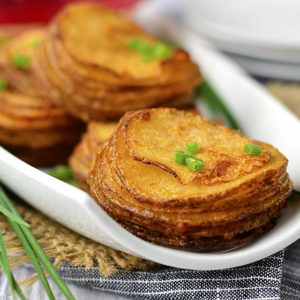 I am telling you – this side dish recipe is SO KILLER!!!! The sprouts would pair well with any of the dishes I’m linking to below, which also call for sweet chili sauce, but also any fun burger recipe, salmon or shrimp dish, or heck even as a sidecar to a simple dinner of sauteed chicken breasts. Whatever you pair them with – enjoy! Preheat oven to 425 degrees then line a half baking sheet with foil and spray with nonstick spray. In a small dish, stir together sweet chili sauce and gluten-free tamari. Set both aside. Trim the ends off the brussels sprouts then slice in half and discard any outer leaves that fall away. Add halved sprouts to prepared baking sheet then drizzle with extra virgin olive oil and season with garlic powder, salt, and pepper. 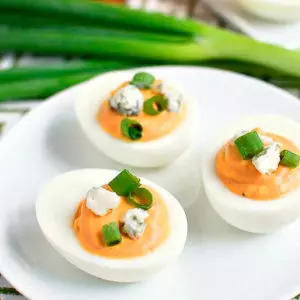 Toss with your fingers to evenly coat then spread sprouts into an even layer cut side down. Roast until golden brown, 15-17 minutes. 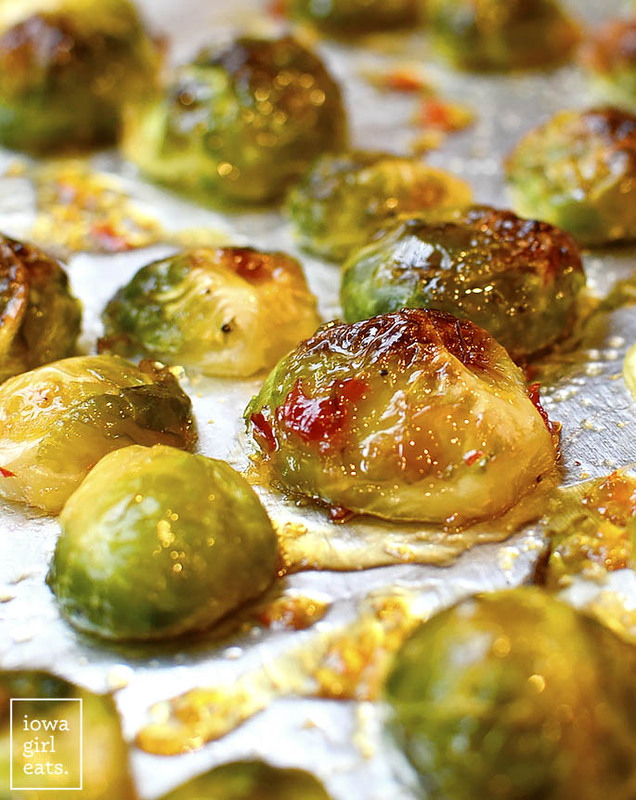 Use a pastry brush to gently brush the tops of the brussels sprouts with the sweet chili sauce mixture then return to the oven and roast for an additional 5-7 minutes or until glaze is hot and bubbly (watch carefully to avoid burning.) Sprinkle with chopped peanuts if using, then serve. This is very timely – I just bought some sweet chili sauce to go with asian lettuce cups this weekend and was wondering what to do with the rest of it!! Oh perfect!! 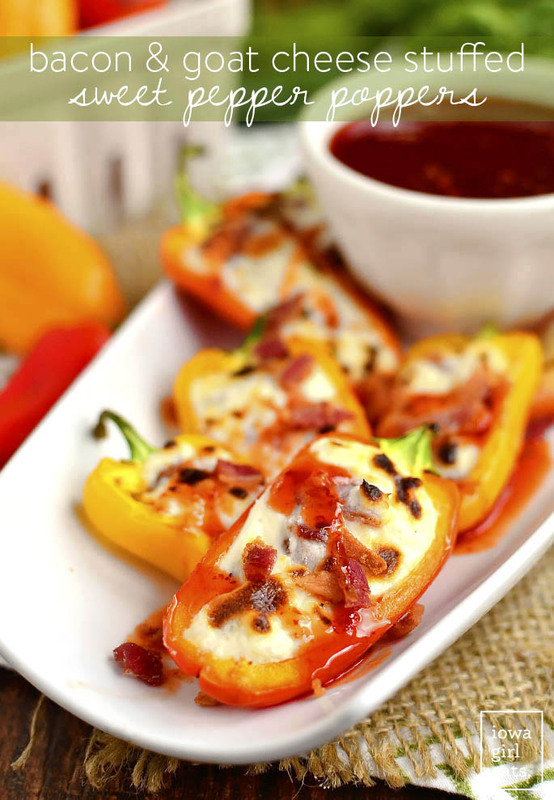 If you like goat cheese, those poppers at the end are ?????? I am also a HUGE fan of roasted brussels sprouts and I will definitely try this. Additionally, I stumbled upon another great way to prepare them the other day: I had a partial jar of red pepper pesto leftover from a soup recipe (just the store-bought kind), so I seasoned my sprouts and then mixed them around with a scoop of red pesto before roasting. It was so easy and they turned out SO GOOD. Ooooo that sounds fabulous! Will have to remember this trick the next time I have pesto on hand! YUM! I have been crushing roasted brussels sprouts lately, so this will be a nice way to mix it up! 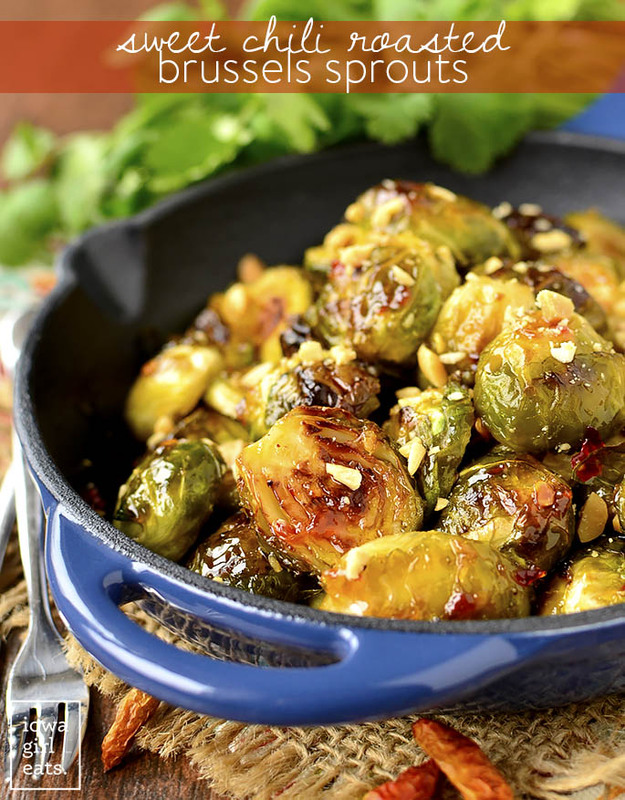 L-O-V-E roasted brussels – I do not make them often enough! I’ve made a bajillion (I counted :) ) of your recipes and noticed recently that you’re calling for garlic powder, salt & pepper rather than garlic salt & pepper. Is that a conscious change? Just to better control the amount of salt? Or am I imagining things? I love roasted brussels sprouts! 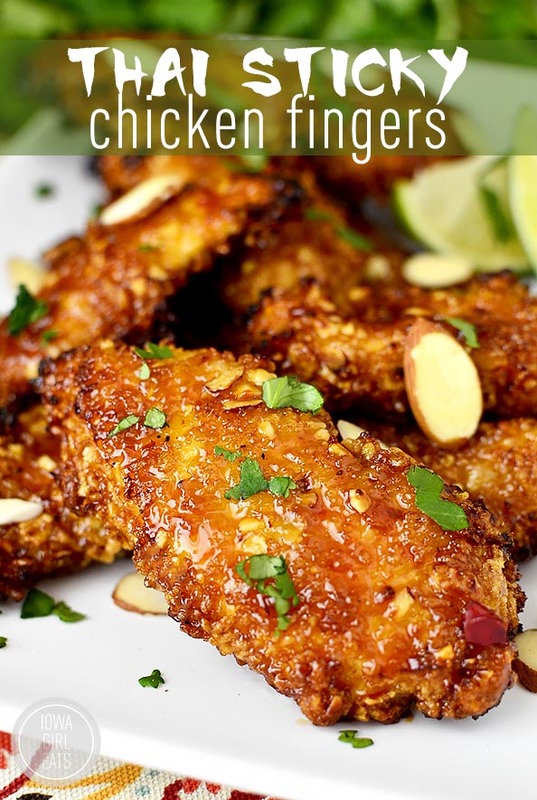 I usually do a balsamic glaze (and add bacon), but I’m definitely trying these this week. 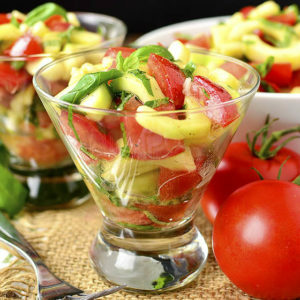 Yummm – love that! Have you tried Roca’s charred brussels? 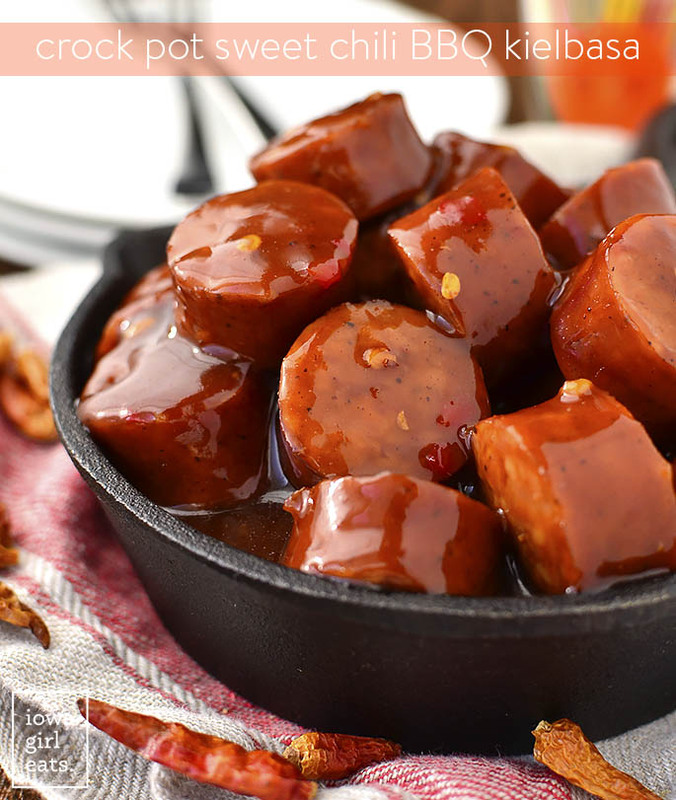 They come with bacon and apple gastrique – UNBELIEVABLE. I always struggle w/ ideas for side dishes! I also really want to like brussel sprouts & so far have been underwhelmed; this recipe could be the ticket! Also, thank you for always sharing options for those of us who don’t have gluten sensitivities. 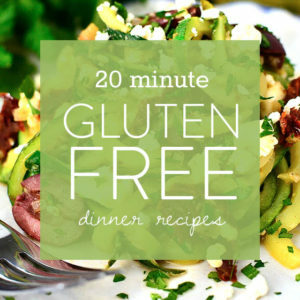 I’ve been a reader since way before you got celiac & keep coming back for your delicious, easy recipes, and I appreciate being able to use what I already have in my pantry. Thanks! I’m so glad to hear that Julie, and thank you for your loyalty! That just goes to show that eating gluten-free isn’t so different from how many people eat anyway! Looks like an easy and quick way to spice up brussels sprouts. STAWP these look amazing! Roasted brussels sprouts are literally my favorite food, not even joking here! 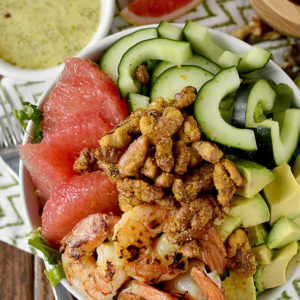 Love the sweet and savory combo! This looks amazing! I am a newly converted Brussels sprouts lover and this will be a perfect side dish. On another note, I just found out my 12 year old daughter may have gluten sensitivities. And she loves bread! What gluten free bread do you recommend? I’ve never used sweet chili sauce. Is it spicy? Not really – I’d say it’s a 2 or 3 out of 10 on the heat scale. Made this over the weekend, and it was delicious! Thanks so much for the recipe. 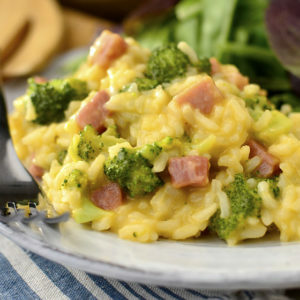 I will most certainly be using this in my weekly side dish rotation. I’m so glad to hear it, Courtney!! Thanks for the great feedback! I’ve made this recipe twice already! Hands down, it’s the best brussel sprout recipe I’ve ever made. It paired perfectly with grilled salmon. Thank you! Makes my heart so happy! Thanks so much for your feedback, Lindsay – I’m so glad you loved the recipe so much! Were you aware that you could find many ultra-fast ELITE and SOCKS5 proxies at https://publicproxy.net/ – try them! Free for all! Bragg Liquid Aminos is a GF low sodium alternative to soy sauce, you can buy on line and many health food stores will also carry it. I used it in your sweet chili roasted brussel sprouts recipe. This Brussels sprouts recipe is so easy and much different than my standard recipe. What a nice surprise! Where do you get your GF nuts? I know Blue diamond almonds are GF but besides ordering online (and paying a ton) I can’t find any. Thanks! I get my gluten-free peanuts at Nuts.com!